Do you own your own cap and gown? As long as it’s black, you can purchase a hood and tassel for only $23. Remember, the deadline is May 20! Any questions can be directed to Jeri Dmyterko at 888.GO.PEIRCE (888-467-3472), ext. 9120. *Business Office Hours: Monday through Thursday 9 a.m. to 6 p.m. and Friday 8:30 a.m. to 5 p.m. For renovations, the Business Office will be located on the lower level of College Hall from April 25 through 29, and on the third floor of College Hall from May 4 through 20. Please be advised: There will be no Business Office hours offered on May 2 and 3. Tickets for Family and Friends: Once a cap and gown has been purchased, graduates may request up to seven tickets for their guests. Ticket requests can be made at my.peirce.edu under the My Classes tab. Please keep in mind that all guests are required to have tickets and no extra tickets are available! We’ll set up a ticket swap message board on Facebook for those who want to offer up extras they won’t be using. Graduation Portraits: Herff Jones is providing services for any graduate wishing to purchase graduation portraits. Students can go to www.ouryear.com to find out about services and to schedule an appointment. When scheduling an appointment, please enter school code: 87148 and year: 10. Herff Jones will be on campus May 12 from 5 to 9 p.m., May 14 from 9 a.m. to 2 p.m., and June 13 from noon to 5 p.m. All photography sessions will take place in College Hall, room 43. 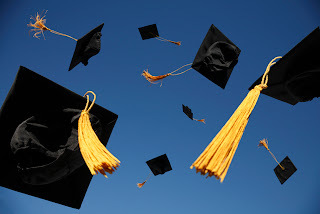 Announcements, Frames, and Rings: Graduates can also visit the Herff Jones website to obtain information about ordering graduation announcements, diploma frames, and college rings. For additional information about diploma frames contact the Business Office at 888.GO.PEIRCE (888-467-3472), ext.9600, or visit the Framing Success website. Open House and Receptions: On Monday, June 13, students and guests are welcome to participate in a tour of Peirce College. Tours will run every 30 minutes beginning at 1 p.m. and ending at 4 p.m.
We look forward to your well-deserved celebration, and wish to make this a memorable event for you, your family and friends! Remember to check the Commencement website for updates and if you have any questions, please leave a comment below, e-mail me, or call me at 888.GO.PEIRCE (888-467-3472), ext. 9265.